← Can Edward and Anastasia Bear be knitted with thicker yarn and larger needles? There are 2 NEW patterns. They are each quite different from each other. 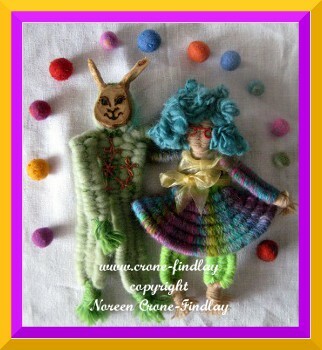 The pattern that I am featuring in this post is for weaving dolls with 6 weaving sticks. 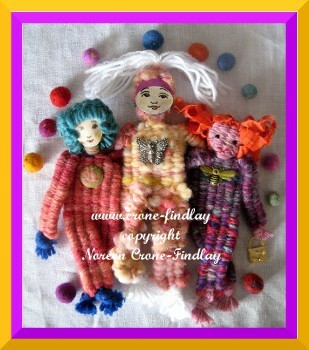 I have designed 7 marvelous dolls to weave with all 6 of the weaving sticks. They are about 8 or 9 inches tall. In this PDF pattern, (16 pages), you will also learn how to weave the circular skirts worn by some of the dolls in a tutorial with step by step photos. Another step by step photo tutorial shows how to use the weaving sticks as a flower loom! And there are photo instructions on how to make wire glasses. There are also how to photos for faces that are woven and for dolls that have faces made from other things: paper, wood, walnut shells and twig slices. There are many different methods shown for how to finish the heads, and the step by step photos showing exactly how to do each step are comprehensive and clear. 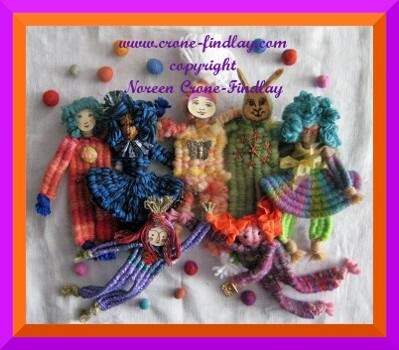 These little woven dolls are delightful on their own, but are also great to use as embellishments on bags, pillows, throws and wall hangings. They are a great way to use small amounts of treasured yarn, whether it’s handspun or not. 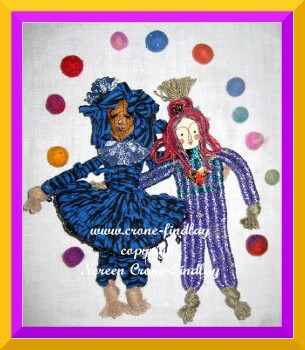 The pattern shows how to weave with yarn, fabric strips and roving to weave these dolls, and how to make each doll unique with nifty hair style techniques.